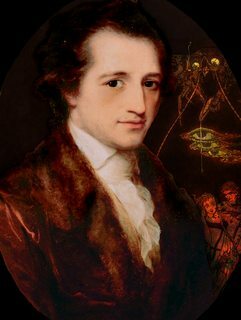 As a young aristocrat in the Imperial Free City of Frankfurt, Goethe was trained in fencing, equestrianism, and classical forms of dance. He was formally educated, and he pursued personal interests in illustration and literature. As a boy, he was particularly enthralled by puppet shows, which were annually arranged by his father. Although he opened his own legal practice in 1771, Goethe was not interested in a life of litigation; subsequently, he did not pursue one. Instead, he lapsed in his studies of the rule of law, and opted to write poetry and fiction. In 1775, due to the success of his novel The Sorrows of Young Werther, he was invited to court in Weimar, where he would become the Duke of Weimar’s confidant. Both he and the Duke joined the Bavarian Illuminati, a movement that drew its membership primarily from existing Masonic lodges. Its members dedicated themselves to the eradication of superstition. Secret societies were banned from Bavaria in 1785; the clubs had acquired two thousand members over a decade, records of which were seized and published, shattering the anonymity of the membership.